I recently wrote a post about the effect of sodium ions in hydroponics and how it is important to keep an eye on sodium levels due to the potentially negative effects they can have on plants. However you may have noticed that sodium is never added alone into nutrient solutions and there is always a counter-ion that accompanies sodium, which is - more often than not - chloride. This ion is very special and it has some clear effects in hydroponic culture. Today we are going to be talking about chloride, how it can dramatically affect plants and why it does so in such a special way. 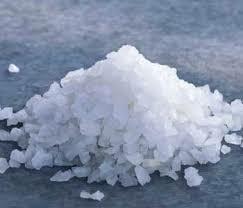 Chloride - not to be confused with chlorine - is a reduced form of the element Cl, an ion with negative charge (Cl-). Unlike elemental chlorine, which is a strong oxidant, chloride is extremely inert in terms of its chemical reactivity and does not appreciably react with anything in a hydroponic nutrient solution. This however does not mean that it is inert when you put it in contact with plants, as a matter of fact chloride is a micro-nutrient - essential for plant life - but it plays such a small role that any important increase in concentration can be detrimental. Usually there is no need to add chloride but simply the chloride present in the water - or as impurities within the other salts - will be more than enough. But what effect does chloride have? Chloride is special in that it behaves chemically in a similar way to ammonium when in contact with plants, that is, chloride can go through plant cells very easily. This means that whatever chloride you put in solution is very readily absorbed, meaning that it counteracts the absorption of other anions very strongly. This is why the expected effect of plants dropping a solution's pH due to the addition of ammonium is completely negated if instead of ammonium sulfate you add ammonium chloride. This is because you add both an anion and a cation that are absorbed very fast, hence you do not affect the cation/anion absorption balance of the plant and the pH will continue to drop or increase in exactly the same manner as before. This anion absorption of chloride implies that it readily competes with anion absorption. This means that if you have chloride and nitrate in solution plants will tend to absorb the chloride instead of the nitrate and you will see symptoms of nitrogen deficiency - not because you don't have enough in solution - but because nitrogen absorption is being hindered by the presence of a very competitive anion. Not only this but other anions, particularly phosphates, will also suffer and therefore you will also start seeing problems with P absorption as well. 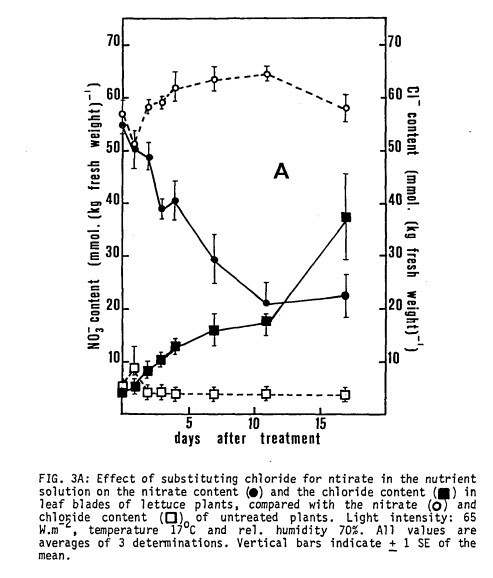 If you're interested in reading more about this I recommend this chloride replacement study showing the dramatic effect it has on nutrient absorption. In many cases, deficiency problems in salinity studies can be attributed to the action of chloride and not so much the direct action of sodium ions. See here for a study that does a direct comparison on seedlings. However since sodium and chloride are very often present in equimolar ratios it is important to always search for both to know what type of problems you are dealing with. Chloride can cause problems at much lower concentrations than sodium, with just chloride concentrations above 20-30 ppm already causing very substantial issues for a wide variety of plants. If you have chloride it is wise to consider this when gauging the concentration of the other anions in solution as their concentration will need to be increased to account for the presence of this ion. As in the case of sodium there is not much you can do to decrease the amount of this ion in solution since almost all chlorides are soluble. Some zeolites - like clinopitolite - might be able to remove some of these ions from solution but the most effective method if your water contains an important concentration of chloride is to use a reverse osmosis machine. If this is not possible - due to costs or water availability - then the best chance you have is to try to increase anion concentrations to try to compensate for chloride absorption. However this will not work if the Cl concentration is very high as the osmotic pressure will be too high for the plants to handle after compensating.